iTunes Asks for Password When Restoring iPhone in Recovery Mode, how to fix? "iPhone disabled and asking to connect to iTunes, but when connected asking for password but iPhone on emergency calls only. How to restore iPhone without password?" Password has been widely used by many iPhone uses to enhance the security of their device. However, it could be frustrating when forget the passcode and receive the message "iPhone is disabled". Most people would perform a restore with iTunes to fix this error, but sometimes iTunes asking for password to restore iPhone. In addition, it will erase all the current data in your iPhone if you have no available iTunes backup file. 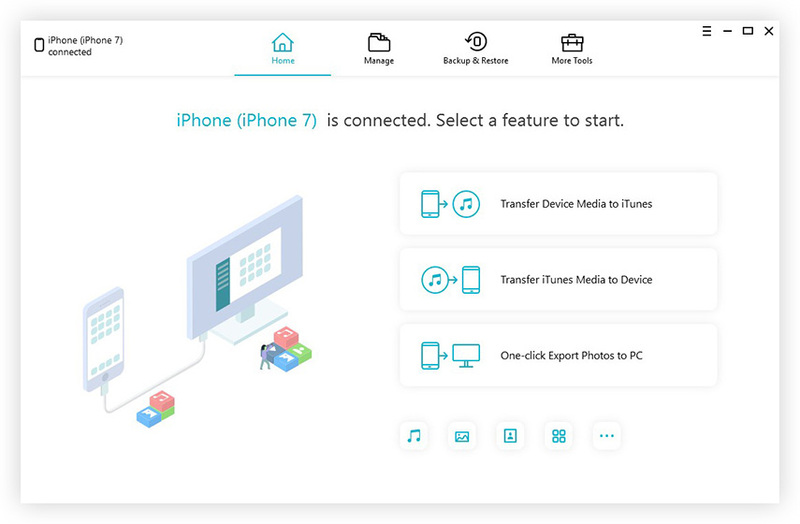 To enable disabled iPhone without losing data, we sincerely recommend you Tenorshare iCareFone - the professional iPhone care tool that can easily reset iPhone without iTunes restrictions. Step 2: Download the firmware package and select a path to save it on your computer. Step 3: After that, you can start to repair your iPhone. There are two repair modes: Standard Repair and Deep Repair. The standard Repair can fix most of the problems, if it fails to work, switch to Deep Repair. Click Next button to start repairing. After the repairing process completed, you'll find that your disabled iPhone has been fixed successfully. Unlock iPhone and remove the passcode with iTunes requires to restore iPhone to factory setting, which will erase all data on your device. If you have synced your iPhone with iCloud, this can be a great way to unlock a disabled iPhone without iTunes. Step 1: On another device, go to iCloud.com/find, sign in with your Apple ID. Step 2: Click all devices at the top of your browser window. Step 3: Select the device you want to erase. If you can't find your device on the list, you should use Recovery Mode. Step 4: Click Erase iPhone/iPod/iPad to wipe passcode and unlock the iPhone without using iTunes. The most reliable and easiest way to prevent accidently getting stuck in zoom mode it to turn off this feature on your device. If you haven't done so yet, try solutions above to exit out of zoom mode first and do as follows. 1. The simplest way is not enter the wrong passcode repeatedly, which will prevent iPhone from locking up and disabling itself. 2. Enable complex passcodes, since they require a longer character string be entered before the password is rejected. 3. Scan your iPhone and make backups from time to time in case you have to restore it to regain access. 4. Keep the device in a safe place to avoid anyone who is intentionally or accidentally entering passwords. 5. Use Touch ID instead of passcode to unlock your iPhone. Touch ID is much safer as the sensor reads fingerprints to enable iPhone.